You may think that I have finally lost my mind. 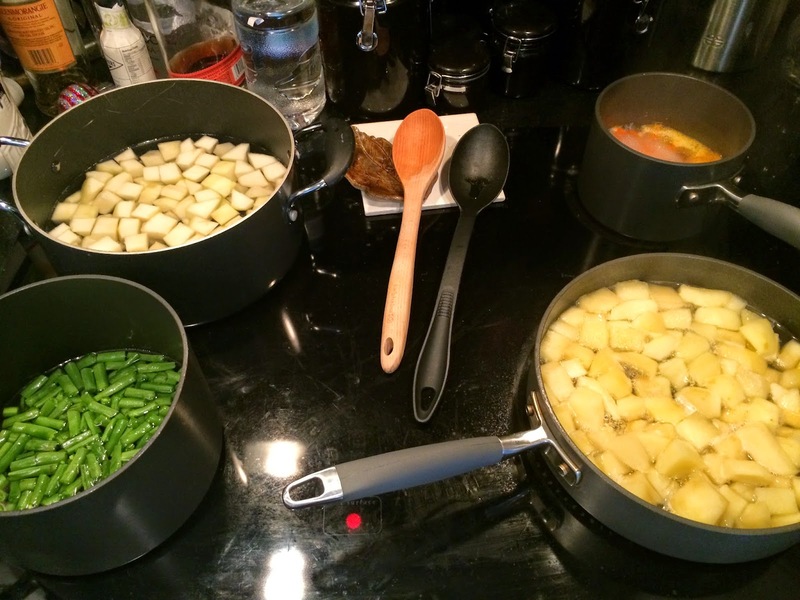 You may be thinking “she’s making baby food for 3 babies!” And, well, yes. Yes I am. And no I’m not crazy. Well, I may be crazy, but this isn’t why. 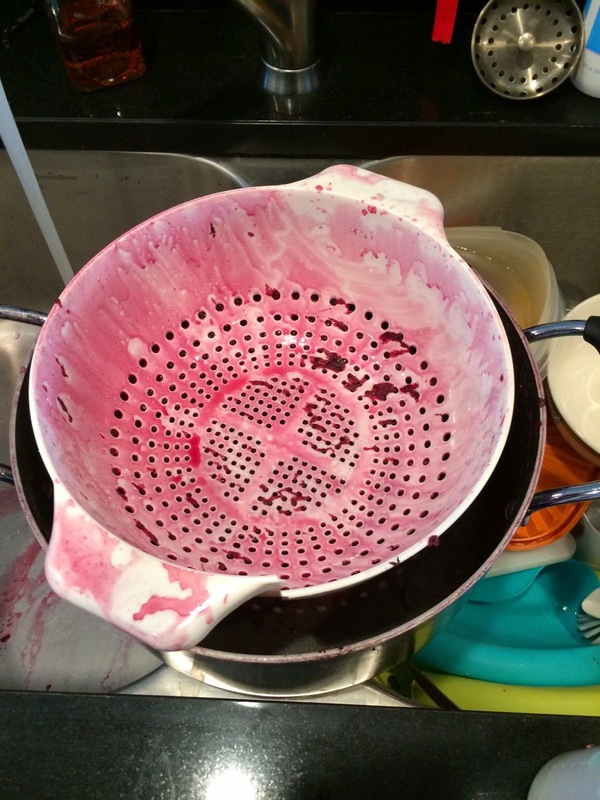 I’m sure you’ve seen and heard about approximately 1 million people who are making their own baby food. Some of them (most of them really it seems) claim to do this because it’s “better” for their baby, they want to feed their baby only organic, they want only the best for their baby. That’s great and all. (And I think pretty much every mom wants the best for her baby.) But that’s not why I decided to make baby food. I have nothing against baby food in a jar. My boys eat it at school for lunch every day. I decided to make my own baby food because baby food is expensive!! So I did what every self-respecting 30-something-year-old mom does – I went to Facebook. And like every triplet mom, I asked my triplet mom friends for advice. Then I also asked a friend from high school whom I really trust with stuff like this what she does. And I basically did what she said. Oh, and one of the best pieces of advice she gave me – the Wholesome Baby Food website. 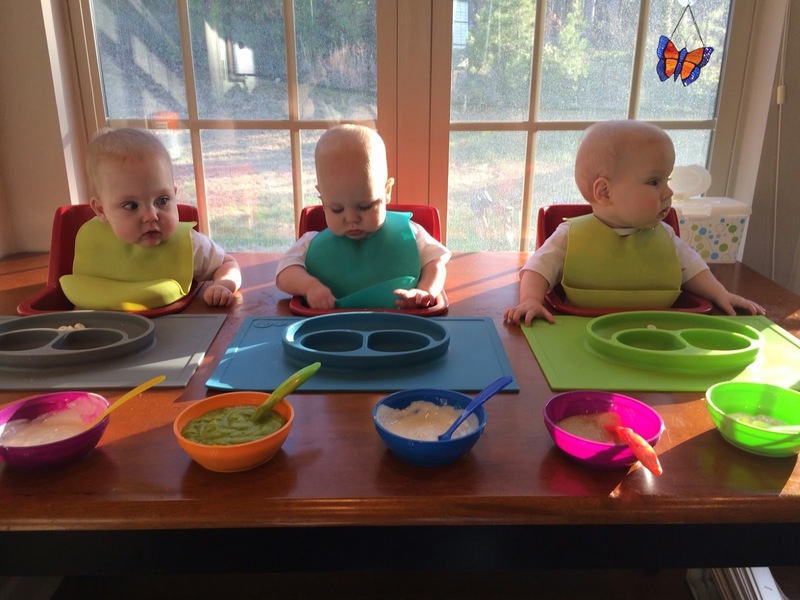 This website pretty much tells you everything you need to know about making baby food, including how to make each specific food and the order in which you should feed these foods to your baby. You can check it out here. See, it’s easy! I’m not crazy! So first I made sweet potatoes. It was super easy. 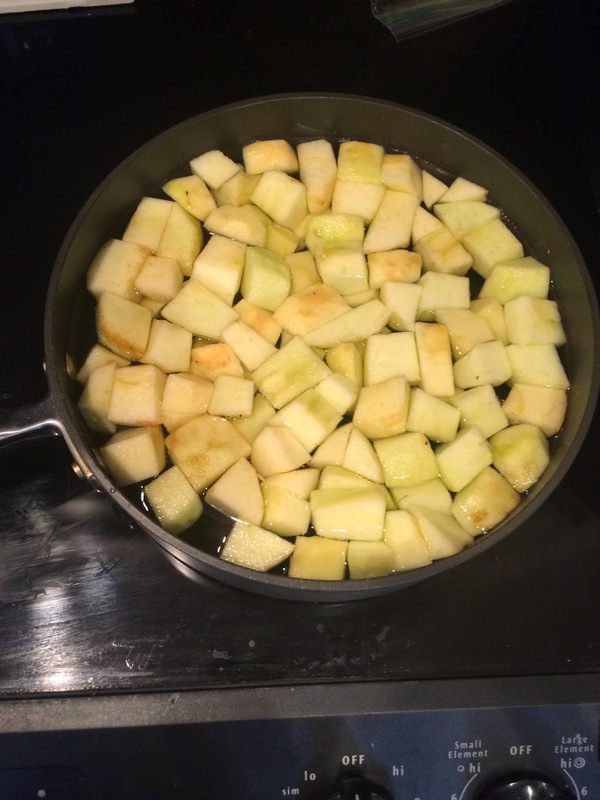 I peeled them, diced them, the boiled/steamed (I don’t know the difference) until soft, and blended. 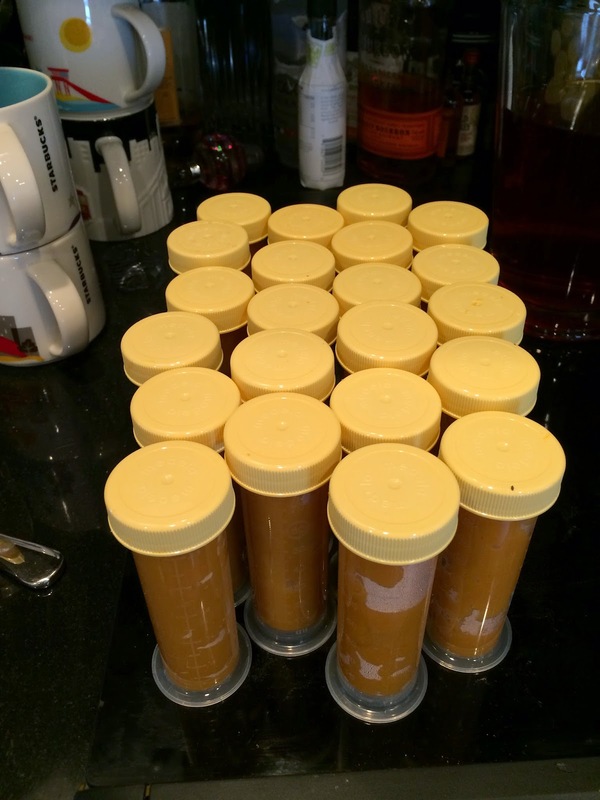 Then I stuck the pureed sweet potatoes in the little breast milk bottles from the NICU and froze them. It made a lot! 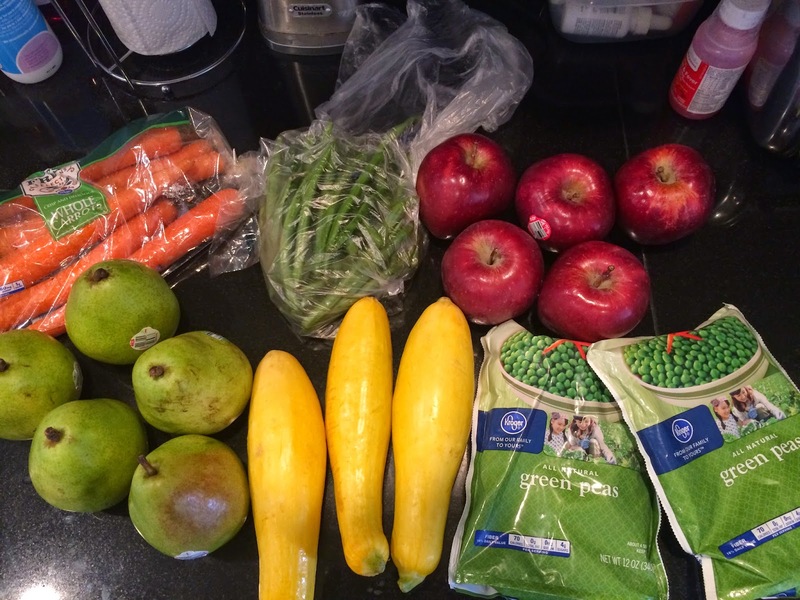 Then I made apples, pears, carrots, squash, peas, and green beans. These were the only foods the boys had tried at that point. The squash didn’t turn out right (because I bought the wrong kind of squash) but everything else went great! Baby Food Making Round 1 Complete! Oh and the best part . . . I made all of that during nap time! 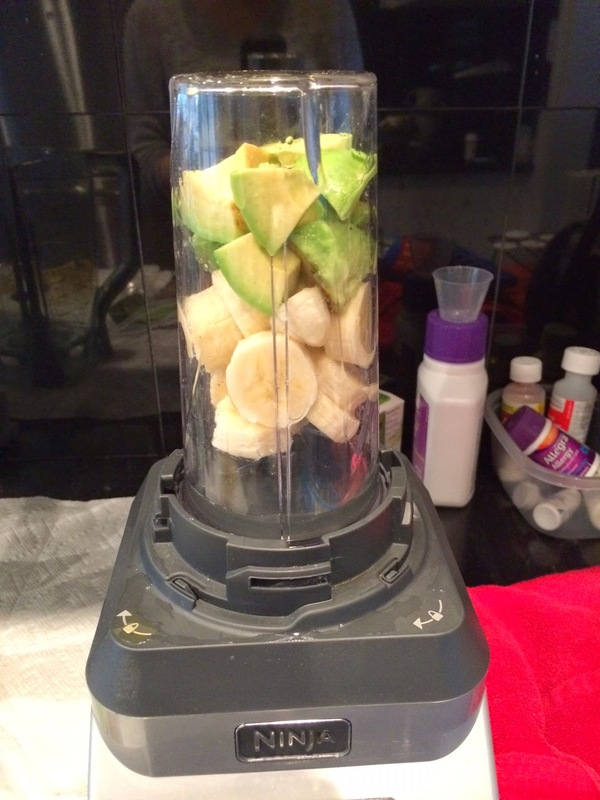 I also “make” the boys avocado and bananas. But there’s no cooking or preparing ahead on those. 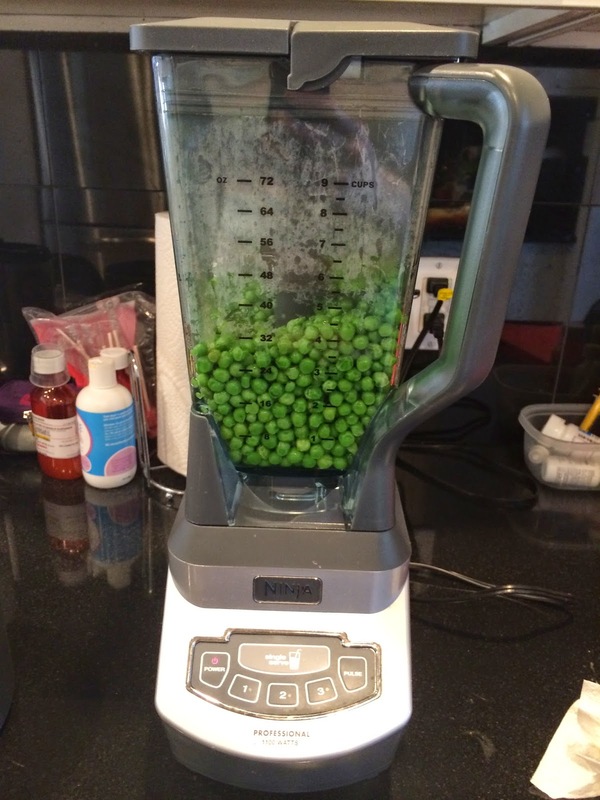 I just stick them in my little single serving blender cup, add a little water, and puree. Since Round 1, I’ve made pears and carrots a second time and I’ve made butternut squash. This past weekend I bought a bunch of frozen fruits and veggies plus some fresh organic spinach (organic only matters to me if it’s something that I don’t peel). I haven’t made all of it yet because I mostly bought stuff they haven’t tried yet. I wasn’t kidding! 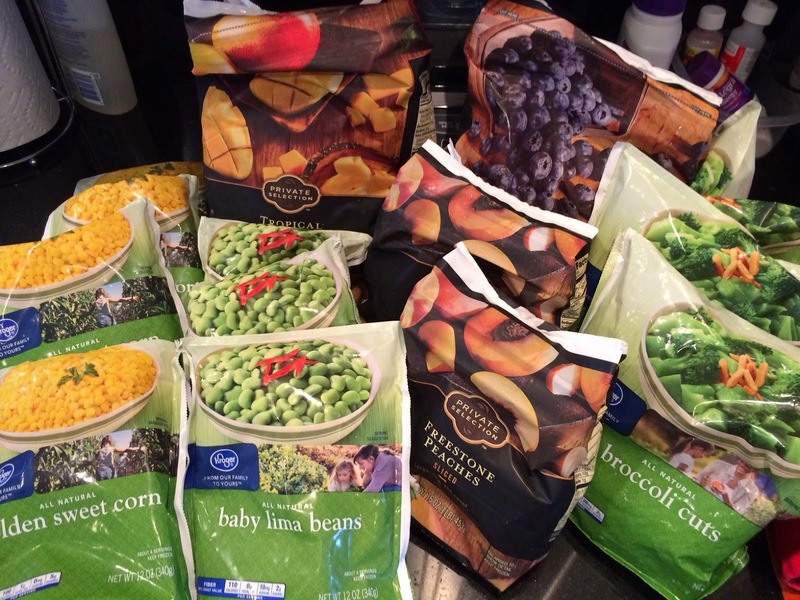 I bought a LOT of frozen stuff! I made the blueberries, mangos, and lima beans the other day. We tried mangos and they LOVE them! I think we’ll try lima beans in the next few days. I’m still scared to try blueberries! I made a HUGE mess making them! I may or may not have left the heat too high and the pot may or may not have boiled over and turned everything remotely close to my stovetop blue. But they made my house smell super yummy! When people say “squash” in connection with baby-food-making they mean BIG squash, like butternut or acorn squash, not summer squash (yellow squash). I bought yellow squash the first time and we ended up eating it for dinner ourselves. Once you remove the seeds and the skin there’s basically nothing left of a yellow squash. 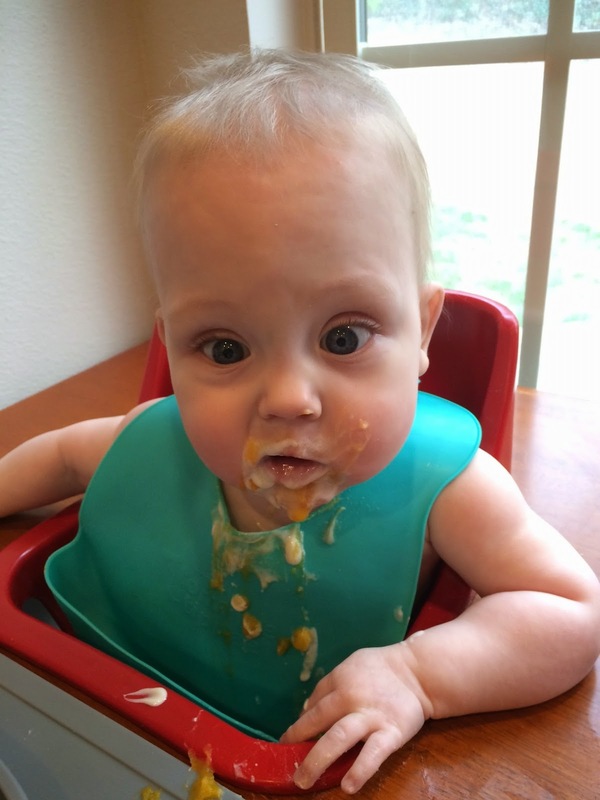 Butternut squash is WAAAYYY better for baby food. And my babies love it. 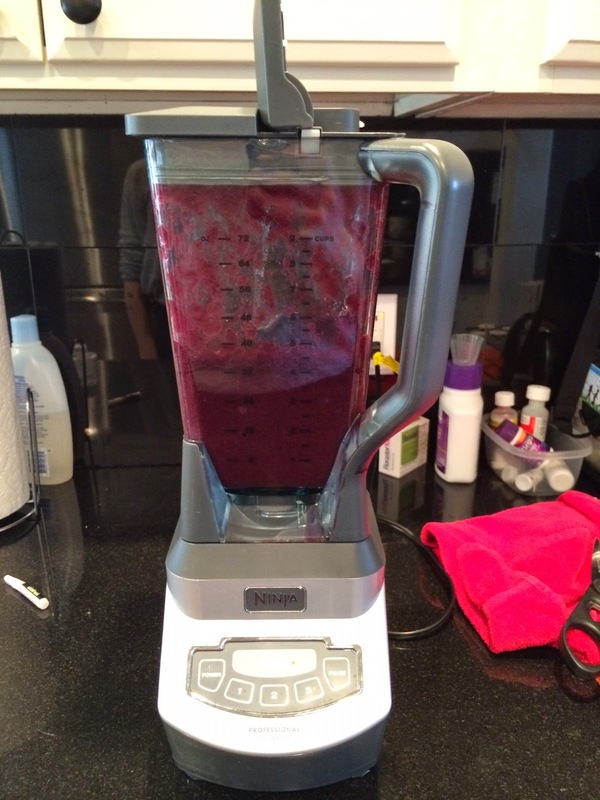 You don’t need the fancy baby food making stuff. I use my regular Ninja blender (it is pretty nice though in my opinion) and I freeze the baby food in regular ice cube trays from Wal-Mart. And most importantly, keep it simple! 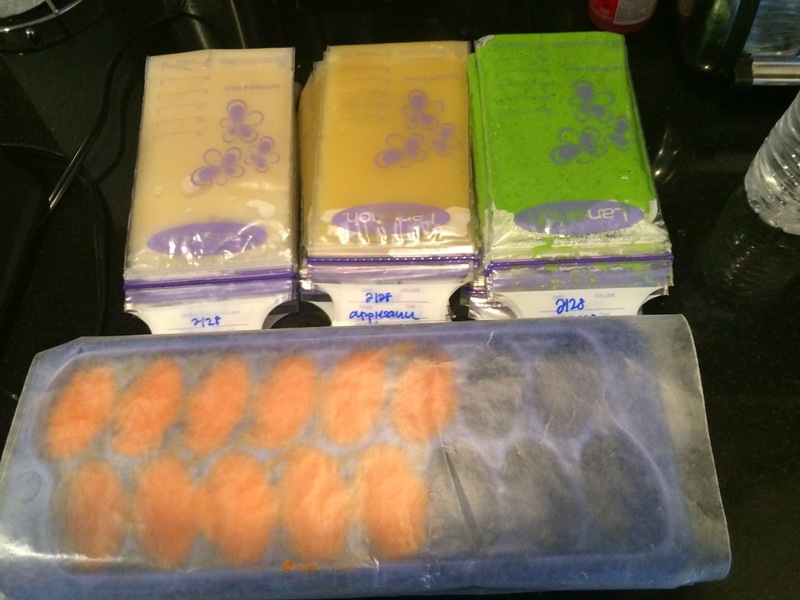 I didn’t have enough ice cube trays when I made Round 1 so I froze some baby food in breast milk bottles and breast milk bags (because I had them and it seemed like a good idea). Well the breast milk bags are great for storage but it’s hard to get the baby food into an out of the bags. The little bottles are great but it’s harder to thaw them quickly. The ice cube trays are the way to go! And they all like oatmeal again. Yay! And yes that’s 5 bowls on the table. 1 bowl of yogurt each (we add calorie powder to Mason’s and Logan’s yogurt to fatten them up and James gets soy) and a fruit and a veggie to share. The green in the picture is actually avocado and banana and the other shared bowl that night was mango, another fruit. So no veggies that night! Oh and to wrap this up, I really enjoy making baby food! I don’t make food for the big people in my house often because it’s crazy town from the time I get home from work until the babies go to bed then I’m just beat and Brian usually makes dinner! So I get the satisfaction of making someone’s food! And Brian helps when needed too! Double digits! Woo hoo! About a week late because everyone was sick on the actual 10 month bday (well we didn’t really have one because there was no February 29 this year). And we did 2 photos shoots because James didn’t want to cooperate the first time! I’m pretty sad that my babies will be 1 in less than 2 months! But I’m also so glad it’s March! I’m mostly excited that February is OVER though! It was a rough one. Mostly the last 2 weeks. I thought we were doing well, then it happened. I’ll tell you . . . but first another picture. Triplet meeting! 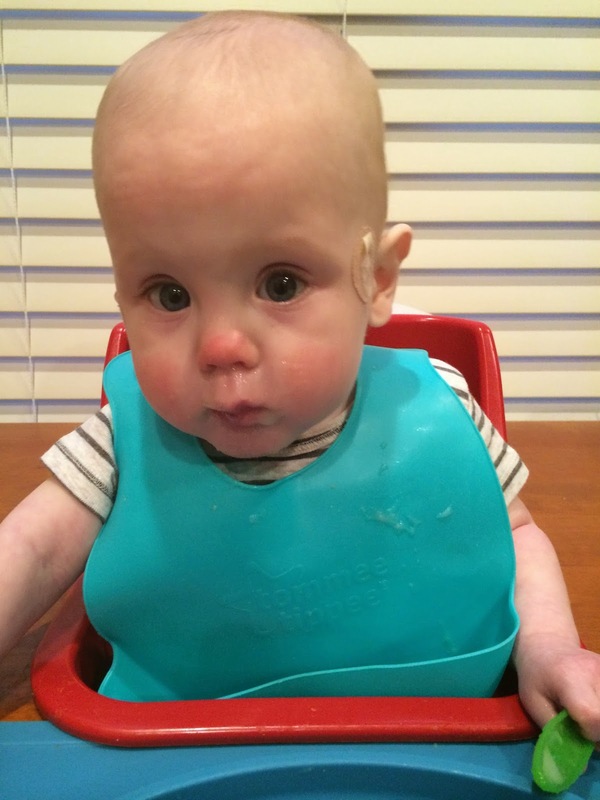 Stomach Virus Round 1 – Mason, James, and me. It was the worst stomach virus I remember ever having. Every time I thought I was better, I wasn’t. It lingered about a week. Stomach Virus Round 3 – Mason, James, Addison, Brian (and my mom and Brian’s dad too). This one was ROUGH! Mason and James couldn’t eat anything and they almost ended up in the ER for fluids. Addison was out for 2 days. Brian was out for 5 days! I slept on the couch for 3 nights. We also had 3 rounds of snow/sleet/ice for a total of 6 snow days. 2 of these rounds of winter weather occurred during Mason’s respiratory virus. Luckily we were able to get him to the hospital during clear days (then Brian got stuck there with him and I got stuck at home with the other 3). BUT everyone is on the mend right now. 1 more month of cold and flu season then hopefully (fingers crossed super hard) we can stay OUT of the hospital for a while (or for forever). And no more of any type of frozen precipitation PLEASE! And now for the fun stuff! Monthly update on all 3 boys! Our biggest issues right now is weight gain. We haven’t really grown in the last month. And Mason and Logan were already falling off their growth curves last month. Mason probably because he keeps getting sick. Logan hasn’t really been very sick so his lack of weight gain is more of a concern. His is likely due to his chronic lung disease – he burns more calories just to breathe than normal babies. Mason and Logan are now going to Nutrition Clinic for weight checks. We increased their formula to 26 calories per ounce, we’re trying to add more volume per day (which is hard because they already get 32 oz. per day and they struggle to finish that), and we’re trying to add calories through spoon feeding. Hopefully all of this will help. Our pulmonologist said that growing is one of the biggest things that will help Mason and Logan’s lungs grow big and strong! James is small but he’s growing along his curve still so no big concern there! Oh and we’ve been eating purees for a month now and they’re all doing great! So far we’ve tried sweet potatoes, carrots, squash, green beans, peas, bananas, pears, avocado, and yogurt (only Mason and Logan). Thier favorites are sweet potatoes and pears. They don’t really care for avocado but I’m going to keep trying because it has lots of good fat and calories! 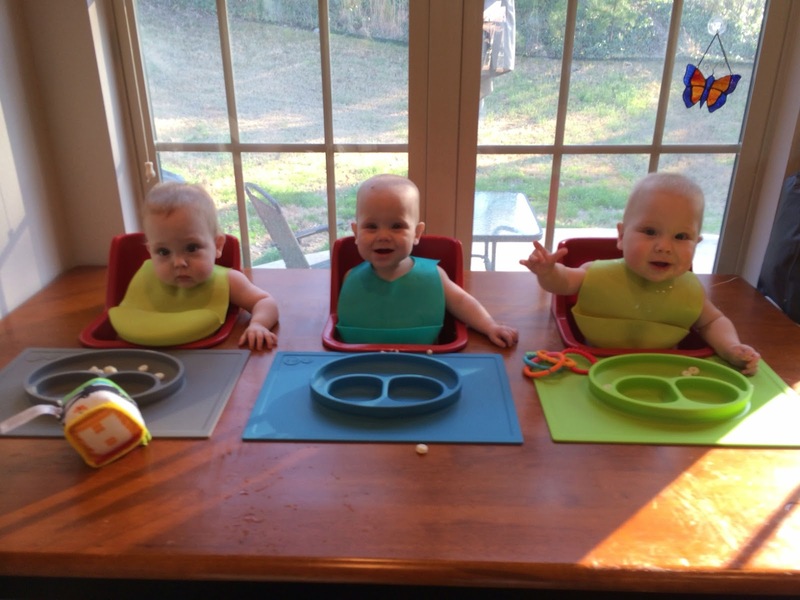 At first only James showed an interest in purees but now all 3 seem to enjoy eating! Yay! I’ve also made some of their baby food and I really enjoy it so far! I’ll write a separate post about that! Ok so here’s a brief update on each one of the boys! Mr. Mason had a rough February with 3 stomach viruses, an ear infection (his 4th I think), and the respiratory virus that landed him in the hospital 2 times. But he’s still always smiling! Mason is the smiliest baby ever. And he’s so sweet. Mason is pretty behind developmentally but he keeps getting sick! And very content to lay on his back and play. He kicks and babbles ALL THE TIME but he refuses to roll over! It’s super frustrating for me but I know he’ll get there! Mason’s hair has also started to grow finally! And it sticks straight up! I love it! Here’s a few pictures of Mason from the last month! The only good thing about the hospital – TV! Creepy sick Mason sleeps with his eyes open! Mason got more mail! This time my Triplet Mom Secret Sister sent him this sweet book! Mason was super excited to come home finally! See, still smiling! Logan has stayed the healthiest out of our entire family over the past month! I’m super surprised because we expected that he would get sick the easiest. Logan did get an ear infection and he got one of the stomach viruses but those were minor compared so some of the other illnesses that went around this house! Logan is using his oxygen again at night. It’s not fun and he HATES it but we know he needs it! Hopefully only a few more days and then we can go back to no oxygen! Logan is a mess! He’s going to be a troublemaker I’m pretty sure! He’s always so busy! He’s figured out how to roll and he rolls everywhere! He’s really trying to figure out how to crawl too! Oh and this one is always babbling! We’re still working on mama but he can say dada and baba so far. He’s also started smiling! He’s known HOW to smile for months but he’s been so serious! But lately he smiles back at whoever. And he has a cheesy grin sometimes too that’s sooo funny! Logan’s favorite things right now are the jumper, his spaceship (another jumper), and Addison! And Sophie the Giraffe. He can’t help but smile when we squeak Sophie. He absolutely ADORES Addison! And he petted Belly (one of our dogs) today and that made Brian’s day! Here are some pictures of Logan from the past month! Logan got to come to work with me when he got sick! He was pitiful! This one is technically after the 10 month mark but it’s so cute I have to share now! Logan LOVES yogurt! I got a bunch of good pictures of Logan during our photo shoot! James has had all 3 stomach viruses this month! Poor guy! We stopped giving him rice cereal after the second one and that helped tremendously! He was projectile vomiting every other night (even when he wasn’t sick) so we tried that and it has helped! He was down for a while with this last stomach virus but he’s back now! Yay! James is super smiley too but he doesn’t like pictures! Ha! At least not my monthly pictures! The picture above is the ONLY smile I got out of James in both photo shoots this month. Oh well! I got other good pictures of James so I’ll take it! James is all over the place these days! He’s figured out how to get places by rolling so he rolls everywhere. Including under or on top of Mason and Logan. Then he gets upset that someone kicked him! James loves his jumper and he gets the biggest grin on his face when he jumps. It’s seriously the cutest thing ever! He also LOVES Addison and thinks she’s the funniest person in the whole world! James also discovered tags and he found his favorite toy EVER. And it’s pink! Picture below! James has figured out how to reach to get picked up and it kills me! He knows it too. It was super pitiful when he was sick. Poor guy felt so bad and all he wanted was for someone to hold him. So we spoiled him a little. Maybe too much because now he wants to be held a little more than before! Oops! Oh well! Here’s a few pictures of James from the last month! Eating with his pink toy! He takes it places with him! Oh and we’ve been working on sitting! James can do it for a minute! Sorry for the super long post! I really need to work on brevity! I can do it for work but not here for some reason! At least I add pictures here right? Last but not least here’s my attempt at a group photo in the nursery chair! At least they’re looking right?